Before a C program is compiled in a compiler, source code is processed by a program called preprocessor. This process is called preprocessing. Commands used in preprocessor are called preprocessor directives and they begin with “#” symbol. Below is the list of preprocessor directives that C programming language offers. This macro defines constant value and can be any of the basic data types. The source code of the file “file_name” is included in the main program at the specified place. Set of commands are included or excluded in source program before compilation with respect to the condition. #undef is used to undefine a defined macro variable. #Pragma is used to call a function before and after main function in a C program. A program in C language involves into different processes. 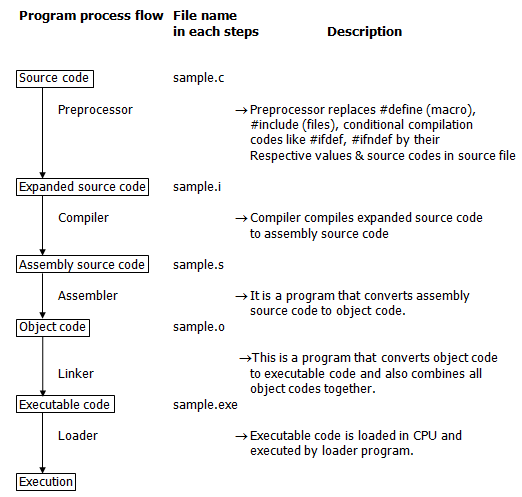 Below diagram will help you to understand all the processes that a C program comes across. First region – This is the memory region which holds the executable code of the program. 2nd region – In this memory region, global variables are stored. Do you know difference between stack & heap memory in C language? Stack is a memory region where “local variables”, “return addresses of function calls” and “arguments to functions” are hold while C program is executed. Heap is a memory region which is used by dynamic memory allocation functions at run time. CPU’s current state is saved in stack memory Linked list is an example which uses heap memory. Do you know difference between compilers VS Interpreters in C language? Compiler reads the entire source code of the program and converts it into binary code. This process is called compilation. Binary code is also referred as machine code, executable, and object code. Interpreter reads the program source code one line at a time and executing that line. This process is called interpretation. Program speed is fast. Program speed is slow. Example: C, C++ Interpretation occurs at every line of the program. Source program is converted into executable code through different processes like precompilation, compilation, assembling and linking. Local variables uses stack memory. Dynamic memory allocation functions use the heap memory. #define – This macro defines constant value and can be any of the basic data types. #include <file_name> – The source code of the file “file_name” is included in the main C program where “#include <file_name>” is mentioned. value of backslash_char : ? “#ifdef” directive checks whether particular macro is defined or not. If it is defined, “If” clause statements are included in source file. Otherwise, “else” clause statements are included in source file for compilation and execution. #ifndef exactly acts as reverse as #ifdef directive. If particular macro is not defined, “If” clause statements are included in source file. Otherwise, else clause statements are included in source file for compilation and execution. “If” clause statement is included in source file if given condition is true. Otherwise, else clause statement is included in source file for compilation and execution. This directive undefines existing macro in the program. Pragma is used to call a function before and after main function in a C program. <function_name_2> This directive executes function named “function_name_2” just before termination of the program. #pragma warn – rvl If function doesn’t return a value, then warnings are suppressed by this directive while compiling. #pragma warn – rch If a non reachable code is written inside a program, such warnings are suppressed by this directive.